Under mounting pressure from an FBI probe scrutinizing the president’s ties to Russia as well as a record government shutdown approaching its 5th week, calls for impeachment are beginning to percolate among political observers. Over the course of President Trump’s presidency, PRRI has surveyed Americans on this very topic. Nearly half (47%) of Americans say that based on what they have read or heard, President Trump should be impeached, compared to 51% who disagree. In February 2017, shortly after Trump took office, only three in ten (30%) Americans supported Trump’s impeachment. Across racial and ethnic lines, women are consistently more likely than men to say that Trump should be impeached. A majority (54%) of women, compared to about four in ten (39%) men, say that based on what they have read or heard, Trump should be impeached. Notably, nearly eight in ten (78%) black women and nearly two-thirds of Hispanic women (64%), compared to only 44% of white women, say Trump should be impeached. A majority (54%) of white women say they do not believe Trump should be impeached. 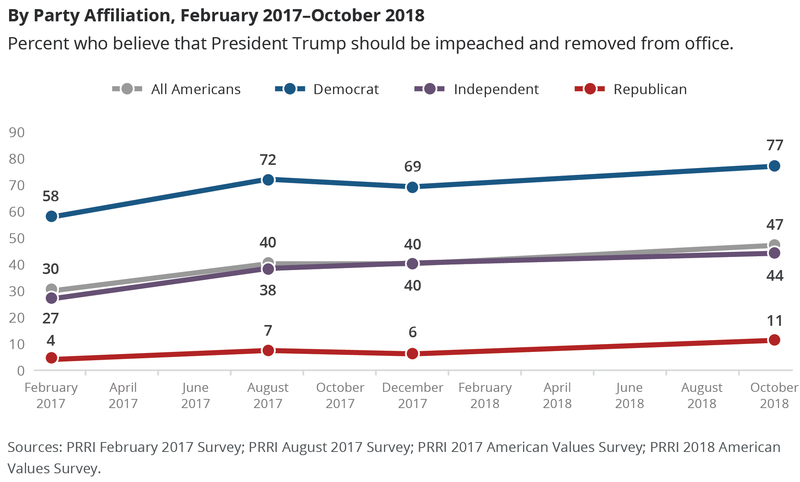 More than three-quarters (77%) of Democrats and about four in ten (44%) independents say that the president should be impeached. Even about one in ten (11%) Republicans agree with this sentiment. Democrats, independents, and Republicans are all more likely than they were at the start of Trump’s presidency to say that he should be impeached (58%, 27%, and 4%, respectively). Notably, the gap between Republicans and independents has broadened significantly over this time, from 23 percentage points to 33 percentage points. There are notable demographic divides among Democrats about whether the president should be impeached. Almost nine in ten (87%) Hispanic Democrats say that President Trump should be impeached, compared to about three-quarters of black (77%) and white (72%) Democrats. Among white Democrats, those with a four-year college degree (80%) are more likely than those without a degree (66%) to say President Trump should be impeached. Democratic women (80%) are also somewhat more likely than Democratic men (73%) to express this sentiment.